The phenomenon of birds in formation has been researched since 1914 by Wieselberger (Wieselberger, 1914), who initially identified a benefit. This benefit was defined in aerodynamic theory by Lissaman et al. in 1970 (Lissaman, 1970). Behind a finite lifting surface, a region of upwash and downwash is created. Both regions are separated by the tip vortex, present due to the finiteness of the lifting surface. A graphical representation can be seen in Figure 1a, showing the tip vortex and regions of up- and downwash behind a C-17 aircraft. Within the regions of up- and downwash, the local effective angle of attack will change. The upwash velocity component will increase the local effective angle of attack whereas the downwash velocity component will lower the effective angle of attack. An increase in the effective angle of attack will locally tilt the lift vector forward, reducing the lift induced drag component. This specific drag component is increased in the region of downwash. The effect of upwash on lift and drag is shown schematically in Figure 1b. The benefit of the formation flight lies within this reduction of lift induced drag, determined to be a 52.6% reduction when compared to a solo flight condition using a Vortex Lattice Method (VLM) ‘AVL’ (Fransen, 2012). This benefit has been proven by multiple research studies throughout the past few decades, most notably by NASA through the Surfing Aircraft Vortices for Energy project (SAVE). Figure 1 – (a) Forces acting on an airfoil when positioned in an upwash flow field; (b) Flow region behind a C-170 transport aircraft, identifying the regions of upwash and downwash separated by the tip vortices. The VLM showed a region of 10% around the vortex core, where the results deviate from what is expected. The black dotted lined box within the subsequent result figures indicates this. Results within this region should be discarded. The position for optimal induced drag reduction, the 52.6% reduction compared to solo flight condition, was chosen at -0.15 y/b lateral separation and 0.1 z/b vertical separation. Figure 2a shows a graphical representation of the trail aircraft with relation to the lead aircraft for this position, -0.15 y/b and 0.1 z/b. 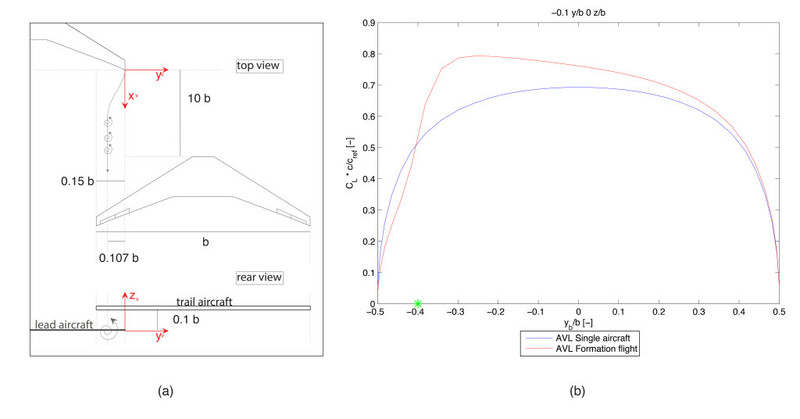 Figure 2 – (a) Graphical representation of trail aircraft with relation to lead aircraft at position for optimal induced drag reduction, -0.15 y/b and 0.1 z/b; (b) Wing loading of trail aircraft rectangular wing with NACA0012 wing profile, flying at standard atmospheric conditions (0 meters) 0.55 Mach with a lift coefficient of 0.55, of a homogeneous formation where both wings are separated by eight wingspans. The formation flight condition implies that a ‘trail’ aircraft flies within the flow field of a ‘lead’ aircraft, as shown in Figure 1, effectively immersing part of the wing in the region of upwash and/or downwash. Due to the localized effect of the upwash and downwash behind the lead aircraft, the trail aircraft’s wing loading will be affected, and the wing loading becomes asymmetric. Figure 2b shows an example of the wing loading when the trail aircraft is positioned at a fixed location with relation to the lead aircraft. The location of the trail aircraft within the wake field of the lead aircraft determines the degree of asymmetry, which decreases with distance with respect to the wake field. This is expected, as the upwash effect also diminishes, as can be seen at the far right end of Figure 1a. The asymmetric wing loading will affect the force balance of the trail aircraft, creating a pitching and rolling moment. The pitching moment changes due to the increase in lift, accompanied by the decrease in induced drag. This local increase in lift will also induce a rolling moment. A coupled yawing moment is also created, where pitch and roll are more pronounced. The degrees of ‘interference’ moments are strongly related to the location in the wake field, making the aircraft statically unstable. A disturbance will make the aircraft change position, where each position induces moments that push the aircraft again to another position, not necessarily the original position. 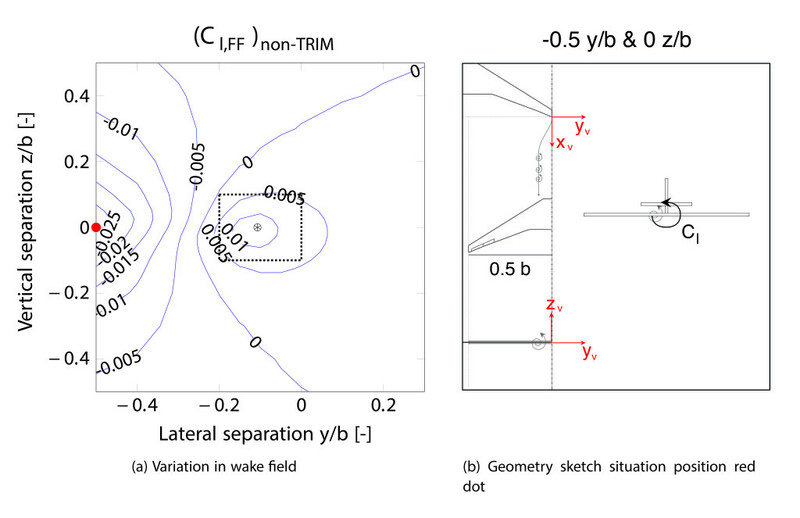 The change in rolling moment throughout a segment of the wake field is shown in Figure 3. Figure 3 – Rolling moment distribution for a segment of the wake field of a homogeneous two A330-300 aircrafts echelon formation flying at 0.6 Mach at 11,000 meters altitude, alongside an explanatory graphical representations of the wake field axis definition and a situational geometry sketch (black star indicates vortex location). To perform an analysis on the impact of control deflections upon the induced drag benefit during a formation flight, an analytical simulation model was used. The model has a modular built up and was created by Mark Voskuijl and others (Pfeiffer et al., 2011) (Voskuijl et al., 2012). 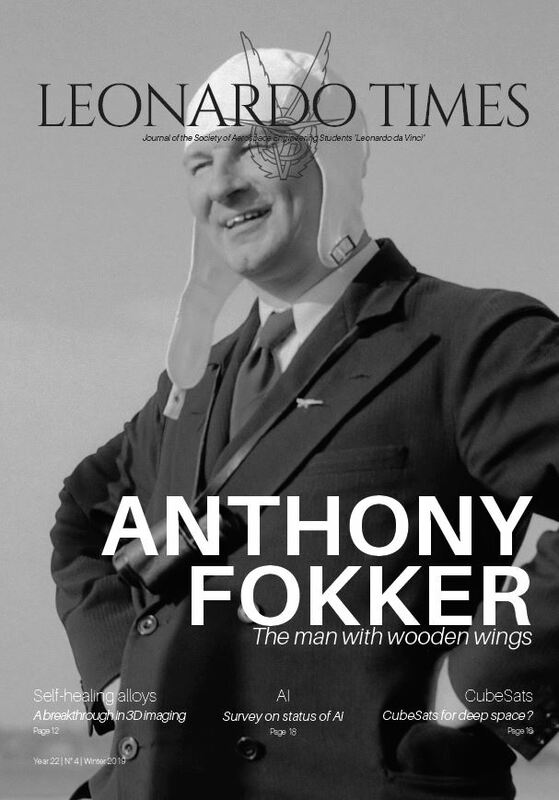 The model was able to analyze and run simulations with aircraft geometries, when the aerodynamic data was provided. The model was extended and adjusted to perform the formation flight analysis. The positional analysis of the trimmed trail aircraft in the formation flight condition, at multiple positions in the wake field, showed a reduction in benefit of 5% at the optimal position, -0.15 y/b and 0.1 z/b. The difference further increases when moving away from this position. Figure 4 shows both the induced drag reduction in untrimmed condition as trimmed condition for a segment of the wake field, accompanied by a graphical representation at the position of optimal induced drag reduction. Flight at the optimal position also revealed a potential fuel flow reduction of 18%, due to the reduction of induced drag. Although this is an estimate, it proves that much can be gained by flying in formation. The initial quantification of the impact of trim upon the formation flight together with the fuel flow benefit highlights the importance of further research. Figure 4 – Comparison of induced drag reduction of the trail aircraft in formation flight, compared to the solo flight condition, in untrimmed and trimmed condition accompanied by a graphical representation of the optimal induced drag position (-0.15 y/b and 0.1 z/b). The simulation model was also used to briefly perform a dynamic analysis, by solving the state space representation of the trail aircraft in formation flight. An unstable condition was highlighted by positive real eigenvalue solutions, where other eigenvalues showed stable behavior. As was highlighted before, further research into the dynamic and static stability behavior is required. Van der Kleij did a study upon the stability topic by analyzing and designing a controller for the formation flight of a Boeing 747 (Van der Kleij, 2012). The inability to retain one position within the wake field without requiring active control was highlighted, although the study showed that no dangerous situation was created by the formation flight condition. At the optimal location, the aircraft would have been experienced a volatile pitch down and a left hand roll, behind the lead aircraft. Research on the topic of formation is ongoing, the NASA Surfing Aircraft Vortices for Energy (SAVE) project being the most notable one. Recently presented studies show the development models and tools to further analyze the effects of formation flight (Halaas et al., 2014) (Slotnick et al., 2014). Next to the theoretical approach, test flights are performed using a C-17 aircraft to quantify the (dis-)advantages (Bieniawski, 2014). The test flights have already shown a potential fuel flow reduction ranging between 7-9%, only half compared to the results of the simulation model. The simulation model, however, neglected viscous and compressibility effects. To conclude, formation flight remains a popular research topic, where the reduction in induced drag effectively can result in a significant reduction in fuel consumption. The power lies within the operational aspect, where the current aircrafts can be used to fly within a formation. However, attention must be paid however into the fatigue life of the control surfaces as well as the aero-servo-elastic interactions, which was beyond the scope of this research. This may pave possibilities for further master thesis topics and interesting studies.